(Newser) – Hot on the heels of showing up to a Brisbane concert three hours late, Madonna is making headlines yet again for exposing a teenage audience member's breast at another concert in the city. The Material Girl pulled Josephine Georgiou onstage and tugged on her shirt, briefly exposing the 17-year-old's naked breast to the audience. "Oh s---! 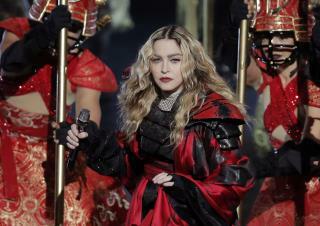 I am sorry, sexual harassment," said Madonna, per the New York Daily News' video of the incident. Not exactly a GWAR concert, but not too bad, either. It was Australia so no one cares ..... breasts only raise hysteria in 3rd world Islamic countries and America.